If you're scouting for a casual yet stylish getup, team a blue denim bomber jacket with Hugo Boss boss delware jeans. Both garments are totally comfortable and will look great paired together. Beige leather sandals will deliver a more relaxed feel to your getup. 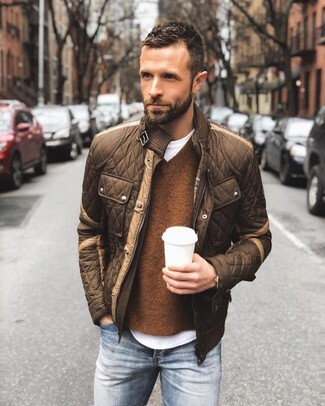 If you're on the lookout for a casual yet on-trend outfit, try teaming a black leather biker jacket with Hugo Boss boss delware jeans. Both pieces are totally comfortable and will look great paired together. If you're after a casual yet stylish outfit, rock a blue denim shirt with Hugo Boss boss delware jeans from farfetch.com. Both items are totally comfortable and will look great together. When it comes to shoes, this ensemble is complemented nicely with navy suede espadrilles. If you're on a mission for a casual yet dapper outfit, try teaming a light blue denim jacket with blue jeans. Both garments are totally comfortable and will look great paired together. Black leather low top sneakers are an easy choice here. 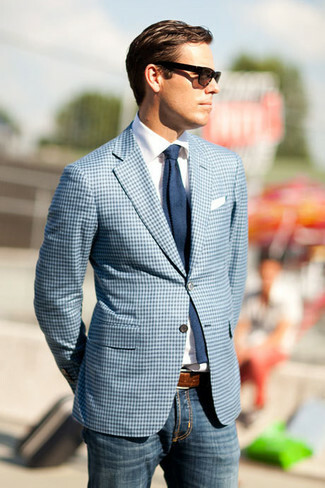 If you're on a mission for a casual yet stylish outfit, wear a light blue gingham blazer and blue jeans. Both pieces are totally comfortable and will look great together. If you're on the lookout for a casual yet seriously stylish ensemble, dress in a black short sleeve shirt and Hugo Boss boss delware jeans. Both pieces are totally comfortable and will look great paired together. Kick up the cool of your outfit by completing it with black leather loafers. 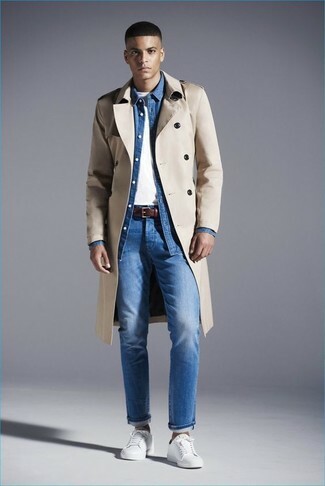 For a casually elegant getup, try pairing a beige trenchcoat with blue jeans — these two pieces the place of work really well together. To break out of the mold a little, throw in a pair of white low top sneakers. 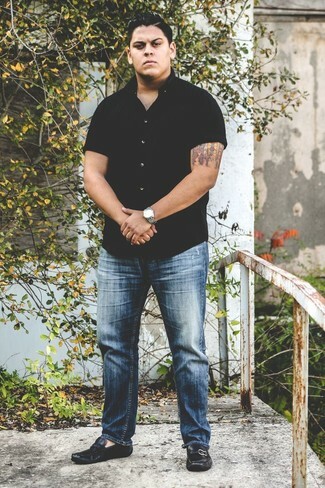 This combination of a red long sleeve shirt and Hugo Boss Boss Delware Jeans from farfetch.com is proof that a safe casual getup can still be really interesting. Our favorite of an endless number of ways to complete this outfit is white athletic shoes. To put together a casual look with a twist, team a brown quilted bomber jacket with blue jeans.